Southeastern Grocers' Hurricane Florence donation program. Grocery retailers have closed stores and curtailed shopping hours with the arrival of Hurricane Florence, which struck the North Carolina coast early Friday. Food Lion, Bi-Lo, Aldi, Lidl, Kroger, Harris Teeter, Walmart and Publix were among the chains announcing temporary store closures in North Carolina, South Carolina and Virginia as Florence passes through the region. Meteorologists expect the storm to hover over the Carolinas through Saturday as it moves inland, rolling over parts of Georgia and Tennessee into Sunday afternoon and then weakening to heavy rain and wind in traveling up the Appalachians toward the Northeast. In terms of store closures, Food Lion is most affected by Florence. The Ahold Delhaize USA chain said on its website that it has temporarily shut 126 stores in North Carolina, 53 in South Carolina and four in Virginia. Governors in the three states declared a state of emergency and ordered evacuations in coastal areas. Walmart reported that it operates 305 facilities — including Walmart and Sam’s Club stores and distribution centers — in the impacted region. Through noon Friday, 96 stores in the Carolinas and one in Virginia were closed because of the storm. At the Walmart Emergency Operations Center (EOC), representatives from across the retailer’s business have been working to help its facilities, associates and customers prepare for and respond to Florence. The company said that, in advance of the storm, it has shipped 1,000 truckloads of water, over 60,000 cases of batteries and 33 truckloads of personal generators. Kroger said it has shut down four stores in South Carolina and suspended grocery pickup and/or delivery in six South Carolina stores, eight Georgia stores and five Virginia stores. Harris Teeter, a Kroger Co. subsidiary, announced closings for 24 stores in North Carolina and 18 stores in South Carolina. Through 2 p.m. on Friday, Aldi had closed or announced plans to close 27 locations in North Carolina and 10 in South Carolina. Fellow hard-discount grocer Lidl has reported closures of eight North Carolina and three South Carolina stores. Publix has closed or plans to close 13 stores in North Carolina and 18 in South Carolina as of mid-afternoon on Friday. And Bi-Lo, part of Southeastern Grocers, has shuttered five South Carolina stores due to the storm. “In an effort to proactively aid our customers, we are launching a community donation program, together with the Southeastern Grocers Gives Foundation, in support of the American Red Cross Disaster Relief to assist those impacted by Hurricane Florence,” Anthony Hucker, president and CEO of Jacksonville, Fla.-based Southeastern Grocers, said in a statement on Friday. Under the program, which runs to Sept. 25, 2018, customers at Southeaster Grocers’ Bi-Lo, Winn-Dixie, Harveys and Fresco y Más supermarkets can make financial donations at checkout to support Hurricane Florence relief and recovery efforts by the American Red Cross. Salisbury, N.C.-based Food Lion on Friday said it has begun now accepting financial donations for Hurricane Florence relief at its 1,000 stores. At checkout, customers can donate any amount they choose or round-up their purchase to the nearest dollar. 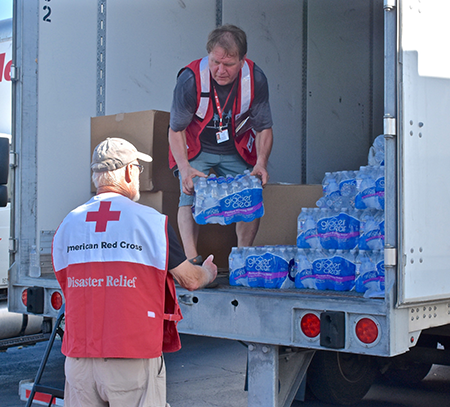 Food Lion will donate 100% of all funds raised through Sept. 30 to the American Red Cross Disaster Relief effort. Hurricane Florence’s came ashore at Wrightsville Beach, near Wilmington, N.C., at 7:15 a.m. ET on Friday with sustained winds of 90 miles per hour, according to the National Hurricane Center (NHC). The storm’s winds, however, fell to 75 mph by 1:50 p.m. The NHC said parts of North and South Carolina may get as much as 40 inches of rain.